Workers distribute aid items from UNICEF to Syrian refugees at a camp in the town of Bar Elias, Bekaa Valley, Lebanon, Jan. 10, 2019. The United Nations says conditions are not right for the safe, orderly return of large groups of refugees from Lebanon to the homes they fled in Syria, although fighting in that war-torn country has largely subsided. Syrian refugee children play outside their family tents after heavy rain at a refugee camp in the town of Bar Elias, Bekaa Valley, Lebanon, Jan. 10, 2019. 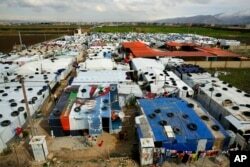 "Internal security in Lebanon are transmitting the names of the people who want to go back to Damascus. Then, in Damascus, these names are vetted and once they are vetted or cleared, the response comes back to Lebanon and that is when the return is taking place," Lazzarini said.